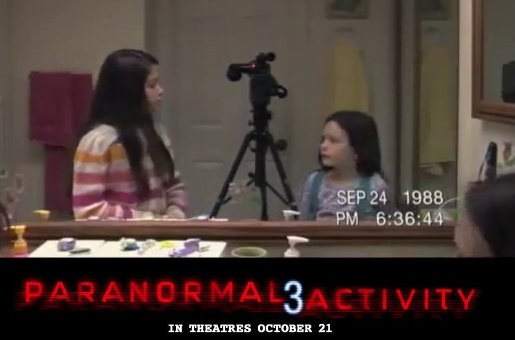 In 1988, young sisters Katie (Chloe Cserngey) and Kristi (Jessica Tyler Brown) encounter an invisible entity haunting their home. Although it appears friendly, it turns hostile, tormenting the young girls and their family. A scene near the start of the film, which is based before the second film, features Katie (Katie Featherston) bringing over a box of video tapes to the home of her sister Kristi (Sprague Grayden) and after leaving Kristi starts to sort through some of tapes, being filmed by her husband Daniel.